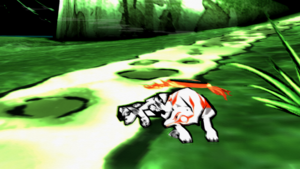 Ōkami​ is an action-adventure video game. 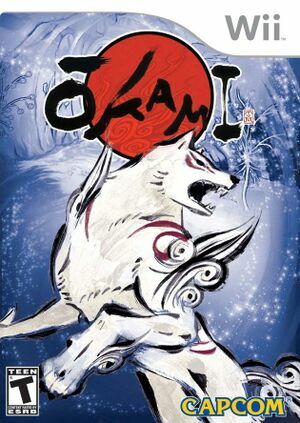 Set sometime in classical Japanese history, Ōkami combines several Japanese myths, legends and folklore to tell the story of how the land was saved from darkness by the Shinto sun goddess, named Amaterasu, who took the form of a white wolf. It features a distinct sumi-e-inspired cel-shaded visual style and the Celestial Brush, a gesture-system to perform miracles. Using the Celestial Brush's rejuvenation skill will cause the game to appear frozen; audio and video will both be stuck. If you continue to hold B for 5-30 seconds (depending on your system), it will unfreeze and the brush will work as normal. Refer issue 8452. There are some random freezes in Windows (specifically Windows 7), but using XAudio2 for the audio back-end seems to lessen the frequency of those. 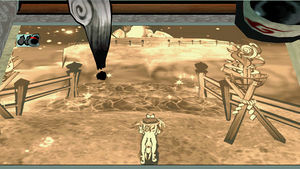 If using higher IR bloom effects result in multiple offset images creating an off putting effect. When using anti-aliasing the relative input for the Wiimote to use the brush with a gamepad, the brush doesn't reach the full screen width. Refer issue 8452. Fixed in 5.0-7714. The graph below charts the compatibility with Ōkami since Dolphin's 2.0 release, listing revisions only where a compatibility change occurred. This page was last edited on 11 July 2018, at 00:00.